We’ve been living in Bali for over a year now and as you can imagine, the months have just flown by. I suddenly realized that it was about time I got out there and tried a few more warungs (simple roadside eateries) for a taste of Indonesian street food aside from the famous ones I’ve been to: Naughty Nuri’s, Made’s Warung and Ibu Oka. Caught in the usual traffic jam at the Simpang Siur roundabout, T and I decided to take a break and try Campur Campur (the one nearest to the roundabout, there is another one further up the Sunset road). It’s the one that’s right by the bypass on the left-hand side of the road going to Seminyak with the large orange sign that says Makan Yuuk!!!! We arrived at around noon and there were already several tables taken, always a good sign as it means that the turnover is high and the food is fresh. There is a glassed-in counter near the front for rojak which is sliced tropical fruits drizzled with a spicy palm sugar sauce and another larger glass-enclosed counter at the far end where the prepared food is displayed. There were many dishes on display – mostly different vegetables but also a few main courses – fried fish and fried chicken smothered in spicy sauce. 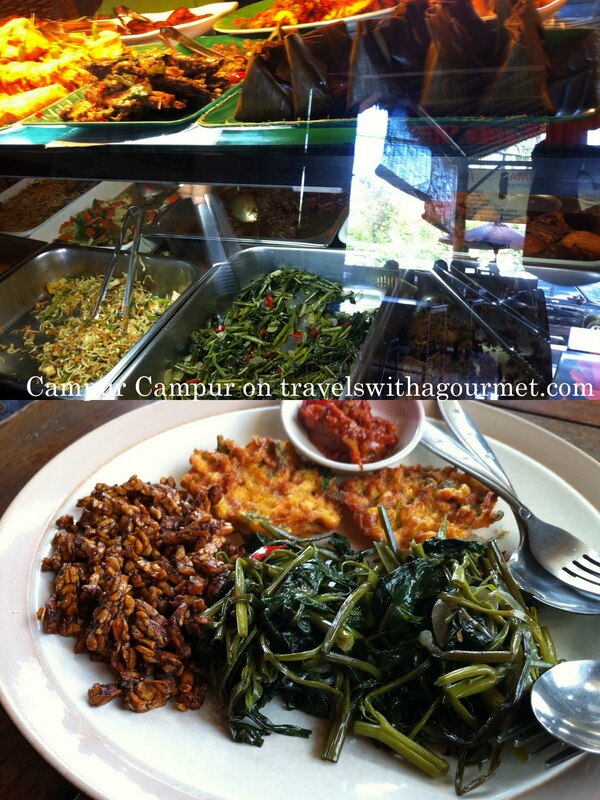 We chose three items from the display: caramelized tempeh (soya bean cake) that was in bite-size chunks, traditional deep-fried corn cakes and stir-fried kangkung with chili which came with a small portion of spicy sambal. We also asked for a portion of sate ayam (chicken satay) which is grilled-to-order right near the entrance in the typical grill-stall-on-wheels that street food vendors use all over Asia. The vegetables were tasty, although less than lukewarm, which is the typical way food is served in warungs. Our platter of chicken satay, about eight skewers, came smothered in a spicy chunky peanut sauce drizzled with kecap manis, the ubiquitous sweet soy sauce used in lots of Indonesian dishes. They were smoky and delicious and the vegetables were the best accompaniment. A simple meal that was surprisingly good. When I mentioned to another friend that I had lunch at Campur Campur, she said that I should try their delicious sop buntut (ox-tail soup) so I guess I’ll be back there sooner rather than later.